Cal’s is a second generation company serving the TriState area for over 40 years! Cal’s Roofing specializes in commercial roofing and residential roofing in the South Jersey area. Cal’s Roofing services all parts of Camden County, Gloucester County, & Burlington County. Cal’s Roofing is locally owned and operated out of Williamstown, NJ. Cal’s is a licensed and bonded roofing company offering quality workmanship and materials at a competitive price. 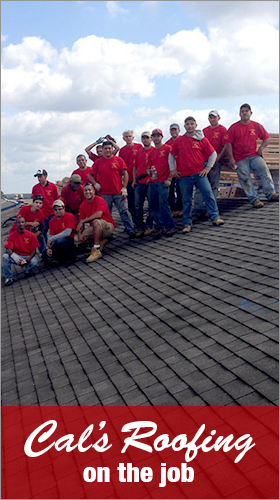 We provide roofing services to homeowners and businesses throughout South Jersey with pride, honesty, and integrity. Cal’s Roofing is committed to installing the best roof systems with the best products to insure you always stay dry and your home looks its best. Our excellence in roofing and drive for maximum customer satisfaction has been noticed by GAF, whom has recognized Cal’s Roofing as a certified GAF Authorized Installer. There is a misconception that “no one gets excited about roofing.” At Cal’s Roofing, there is plenty to get excited about when it comes to your home’s roof. We offer many unique styles, shapes and materials of roofing to accentuate your home’s overall appearance. After the foundation, the roof is the most important part of your home. Keeping this aspect functioning properly will help you avoid unneeded expense. There is no point to wait until there is water damage in one or several interior walls. Cal’s Roofing will add appeal and efficiency to your home to sit your tastes. Adding a simple dimensional earth tone can bring out so much from a home. Cal’s Roofing residential installers are capable of installing virtually any roofing material. These include: fiber glass, light weight, wood fiber, ceramic shingles, tiles and more. Our staff are roofing experts and can assist buyers in selecting a roof that meets their needs for style, durability, color, texture, and cost. For the best results, your new roof should complement your home’s exterior color scheme. But, harsh conditions such as heavy winds and driving rain can compromise the beauty and integrity of your roof. We have the perfect finishing touch at Cal’s Roofing for long lasting esthetics and maximum protection. Be sure to ask us how we can maximize the value of your roofing investment. The choice of roofing material can be one of the most important decisions one makes to bring out the beauty of their home, not to mention the useful service life of their system. Choosing a good contractor to install the roof is just as importing as selecting quality materials. It is true that nearly anyone has the ability to drive a nail through a shingle, but if that was all to proper shingle installation, Cal’s Roofing would not be replacing roofs installed by others after only a couple of years.